The SIDEKICK Pro can easily hold all of your skiing gear as you glide down the mountain this season. 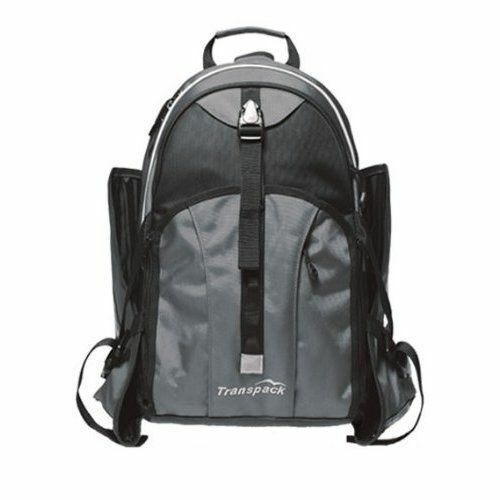 Transpack debuted its newest addition to the Pro-series of carry-all ski/snowboard-boot backpacks in Fall 2008. The SIDEKICK Pro seems to be able to hold everything but your skis. With two padded side pockets with air/water drainage holes for your boots, a large central compartment (1400 sq.in./23 L) for your helmet and gear, a padded laptop sleeve, and a hydration sleeve, you’ll be ready for just about anything a snow covered mountain can bring your way. While this model only comes in four colors – black, navy, red, and titanium – some of the older models are now available in an array of colors and patterns for fashion conscious skiers and snowboarders. We found many other boot bags available for sale, but what is unique about the Transpack Pro-Series is that you can carry almost everything you need on your back, leaving your hands free as your traveling to the mountain, checking in to your hotel, or juggling hot cocoa and snacks after a long day on the slopes. What’s more, you can stow the Transpack into most overhead compartments, neatly avoiding those pesky checked bag surcharges at the airport.